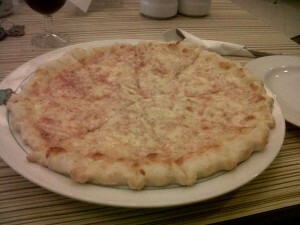 It has taken a long time but I’ve finally found pizza in South East Asia that at the very least, does the job. I won’t begin to try and convince you that this holds up to American standards as far as pizza goes but it’s by far the best pizza in Medan that I’ve found and definitely the best pizza I’ve had in South East Asia. Out of the three main parts of the pizza the crust is the weakest. It’s tough to get that right apparently because even back home the crust is usually what pizza places screw up the easiest. I’m not sure what they’ve done with the sauce because there is usually this very typical sweet flavor of all red sauce here in South East Asia. They must have not included too much sugar because the sauce does its job. It adds flavor but doesn’t over power. Then finally the cheese. It’s not perfect but again, it doesn’t over power the rest of the pizza. You can still tell it’s not the real deal but there is not too much of any one ingredient causing the pizza to taste funny. It’s just the right amount so that the sauce, the cheese and the crust work together to make a very tasty pizza. There are few foods in this world that make my tongue dance the minute it touches them. Back home in the United States it’s definitely a nice thin slice of New York style pizza and maybe BBQ pork doused in delicious sweet sauce. As far as international cuisine, there is green curry chicken in Thailand and flour tortillas dipped in hot white Mexican cheese. (Although I suspect that is more of a Tex-Mex thing) Alfredo sauce just about rounds out all of my favorite foods in this world. Indonesia doesn’t have the most internationally renowned food in the world but there is one item that is the monster of all dishes here, and it’s rendang. 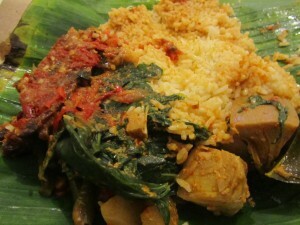 Like most of the good food in Indonesia, rendeng comes from the province of West Sumatra and the Minangkabau people in and around Padang and Bukit Tinggi. I think rendang is an acquired taste as the first few times I ate it I wasn’t sure of the hype around it. It takes a few times to really understand the flavor. Rendang is slow cooked much like a pot roast and seasoned with all kinds of different spices such as lemon grass, chillies, or ginger and made with coconut milk. It’s most commonly made with beef but rendang is also made with chicken and duck. Also like other Indonesian dishes it doesn’t look like much to the eye. Prepared, as usual, on banana leaves it’s widely available throughout Medan. The best I’ve had so far is at a small warung (small restaurant) near my house. I plan to try several more locations. It’s often quite spicy but not so much that it takes away from the flavor. If you’re in Indonesia try to break away from the common menu items in the tourist restaurants such as mie and nasi goreng and hit up a food stall that has rendang. I noticed rendang isn’t often on the guest house menus around North Sumatra possibly due to it’s degree of difficulty in cooking. It’s easily my favorite food now over ayam bakar. Don’t come to Indonesia with out trying it. Nasi goreng and Mie goreng are considered national dishes of Indonesia. 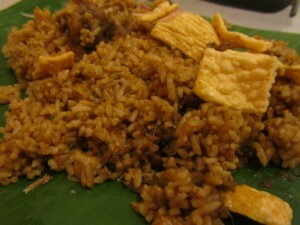 Nasi = rice mie = noodles and goreng means fried. So, it’s simple, fried rice and fried noodles. This is the first food that people usually try when arriving here because it’s simple and recognizable. Usually wrapped in a banana leaf from street stalls, it’s cheap and usually delicious. Specify if you want it spicy, “pedas” or not spicy, “tidak pedas.” It’s also accompanied by a few cucumber slices and nasi goreng special is with a fried egg and ayam (chicken). I usually ask for “tidak pakai telur” (with out egg) as I’m not too fond of fried eggs in Indonesia. Eggs are usually a breakfast thing for me. If you ask a westerner living here or a tourist passing through they’d probably say you can’t go wrong with nasi/mie goreng but to Indonesians it’s a simple meal that can be cooked improperly. I’ve heard on several occasions, Indonesians saying that the nasi goreng they just ate was terrible. When I ask Indonesians what different areas of their country are famous for they usually say Jakarta is fashion and Bali is for tourists. But Medan, while not the most aestetically pleasing city in Indonesia, is almost always synonymous with food. Whether it’s someone from Java or Kalimantan most Indonesians agree that Medan is a culinary paradise. It’s got its own styles and takes on other Indonesian dishes and along with Padang it makes Sumatra a great place to try real traditional Indonesian food. That’s why I’ve started to share some of the food I am eating in what I’ll call Food Fridays! A couple of weeks ago it was Sate Padang. I went to a spot that my roommate suggested a few weeks back. Normally, I would get a famous Indonesian dish called rendeng but tonight it was “habis” or finished! He gave me dendeng instead. Dendeng is thin sliced pieces of dried meat. It isn’t that different from what most of us know as jerky. It’s tough and chewy but pretty delicious. In the style found here it’s usually covered in a red chili sauce and served with rice and vegetables. 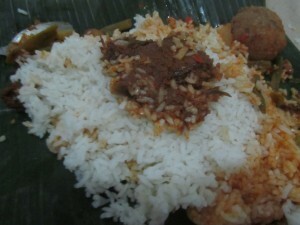 This is another specialty from Padang, West Sumatra. It’s not nearly my favorite thing to eat in Medan but it’s nice every now and then.